How is CCC® different from every other online course? 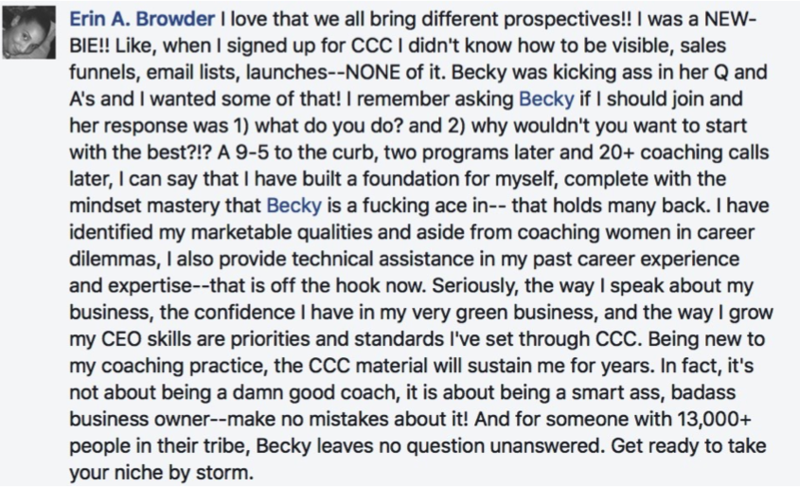 Is CCC® just for coaches? How much help am I going to get? Can I talk to Becky for a minute if I get stuck? I need to make money fast. Will this help? I don’t want this to become yet another thing on my to-do list. Can I go through the course on my own schedule? What if I fall behind? What if I live in Europe (or somewhere else)? What if I’m left-handed and I love squirrels? What if I’m lazy and unmotivated? IS CCC RIGHT FOR ME? Is CCC® only for beginners? Is this course right If I want to create a physical product? Sell my services? I have an idea for a business. Will CCC® work? Is this only for online businesses or can it be applied to my brick-and-mortar company? Now isn’t a good time for me. When will CCC open again? Do I get access to the whole shebang up front? How much time does it take to do this course per week? Does CCC show me how to build a successful business website? Can I get a discount for being a student? In the military? Paying in cash? Non-profit? What if I only need a portion of the program? CCC® includes THE missing piece most online training for coaches totally ignores: The part where we figure out what the heck is blocking you from success. get clear on who you are and what you do. In the end, you’ll finally recognize YOU offer something no one else can, and you’ll understand competition doesn’t exist when you sell your own unique service. understand deep inside you deserve to have a business you love that makes money. 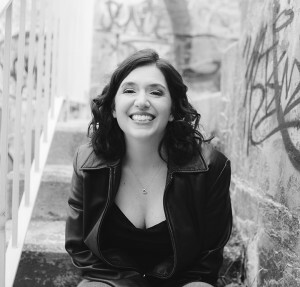 Sure, it includes all the practical stuff most business courses throw at you – an entire copywriting course, visibility hacks and strategy, frameworks for conquering your mindset, and ongoing support FOR LIFE – but it also goes much deeper than that. If you think you’ve already done this, think again. If you had, you’d be making money. And if you really did learn it and you’re not making money, then you’re not implementing it right. Either way, you have a problem. We’ll figure that out here. CCC® also gives you extraordinarily detailed material via video, audio and in workbooks. You’ve seen what other CCCers have done. You’ve seen the details of the program on the page. And you may have read my material for years, seen me all over social media and heard me on podcasts. You have enough information to decide. It’s up to you. I encourage you to look inside and decide if this is right for you. It’s natural to have doubts. We all do — the invisible scripts around starting something online are so deep, they often hold us stagnant for years. If CCC® truly isn’t for you, don’t join. We’ll part as friends with no hard feelings, and I’ll continue sending you my free emails. But if you’re ready to break the shackles, do what you love and get paid what you’re worth, CCC® can help. Nope. It’s for any service-based entrepreneur – web or graphic designer, photographer, healer, mentor, spiritual leaders, trading experts. Women from different locations, niches, and skill levels. Being a coach makes no difference using CCC® principles. As much as I want to. I can’t do 1:1 coaching for everyone inside a program of this magnitude. But YOU WILL have your own 1:1 coach, a member of my hand-picked, personally training coaching team. And I am in our private Facebook group daily, rewriting your copy, offering pointers on sales calls, scheduling, email sequences and more. We built community and support right into the course. Get answers in minutes. It’s worth noting: CCC® will teach you the skills and tools I used to develop a multiple seven-figure business. Your biz isn’t so different. Yes, we all have our own uniqueness, but the foundation is always the same. If you’re in the first one to two years of biz or have been around longer but can’t get traction, now is not the time to hire a 1:1 coach. It’s time to invest in the basics and get them down. I can’t promise you specific results from your online business within a specific timeframe. Nobody can. And you shouldn’t trust anyone who does. Here’s why: We all begin at different levels of experience and skill. We all have different markets. It would make no sense to promise “one size fits all” results just to get you to like me. In fact, I’d rather be honest about the challenging nature of this material, which is why I added lifetime access and ongoing support. If you’re deliberate, methodical, and follow the action steps, you will see results. And looking back a couple years from now, the amount of time you invested will pale in comparison to your rewards. No, and please don’t join. I’m not looking for people who need quick money, because when you’re in dire financial straits, you make short-term decisions. CCC® is about focusing on the long-term. The last thing we need is another thing to make us feel guilty. One of the ways CCC® is completely unique is we begin with the psychology of success – what’s between you two ears and take action toward getting your head on straight as a business owner from day one. CCC® isn’t a brain dump about online business tactics. It’s a complete, measured system for building a successful online business. And with lifetime access, you can progress at your own speed or even take a break. No worries. CCC® goes with LIFETIME access, so you can take a break from the material. Life happens and your CCC® course will ALWAYS be there when you’re ready. CCC® has members from all over the world. Where you live doesn’t matter. What matters is that you use the material. Many, many, MANY people believe something in their lives or about them is so unique, nothing will help. Those people are looking for an excuse not to join. If you truly believe you are so unique that nine years of the most comprehensive material on building an online business will not help you, please don’t join. You have to have the guts to do what you love, believe in yourself and go for it. There’s enough free content on the internet about online business-building for anyone to make millions. Info isn’t the problem. The problem is you need to know how to turn your skills and passions into a profitable business – using a proven, step-by-step system. CCC® shows you exactly that. You’re determined to tackle your blocks. You understand money is not a dirty word and that when we change the way we think, anything is possible. It’s called wealth consciousness. You are determined to regularly increase your income. No way. CCC® can help any level of business owner reach the next step. Again, we’re all about finding your blocks and flushing them down the toilet. Once you’ve done this, your earning potential increases. It doesn’t matter if you’ve been in business for three months, three years or three decades, if you’re not earning new clients and new money, this course is for you. CCC® is designed to help you succeed in sharing your passion and expertise with the world. We intentionally avoid business models that sole focus on selling products. CCC® will show you how to take your expertise and package it up to sell it online, without the frustrations, expenses, and hassles of physical distribution. CCCers come from hundreds of different niches. This program can teach you how to turn your knowledge into services your customers will be delighted to pay for, including earning tens of thousands via coaching and consulting – even if you don’t consider yourself a teacher or consultant. CCC® gives you the marketing insights, mindset work and inner game to build a successful online service-based business. We teach you exactly how to do this, but you must be open to looking at marketing differently. If you’re not ready to change your business to follow CCC® principles, please do not join. CCC® is focused on online business. If you’re looking for strategies to grow your brick-and-mortar store, CCC® is not for you. If now “isn’t a good time,” understand one thing: It’s NEVER going to feel like the right time. It’s never the right time to get married, have kids or move across the country. Or start an online business. We can dream about that magical day when the stars align, but that day isn’t coming. At a certain point you have to stop waiting. To answer the question: I don’t know when the course will open again. Maybe in the spring. Maybe longer. If you want to grow your online business, the best time to get started is NOW. CCC® comes with lifetime access, so if you have to take a break, the course will be waiting for you when you’re ready again. But only if you make the leap and get started. CCC® is an online, 12-week video and audio course. I’ll email you every week with new lessons and bonus material onto the private CCC® site. Supplementary materials are also included – detailed worksheets, scripts, advanced followup techniques, and a thriving support community. One important thing: Don’t worry about falling behind. You have lifetime access to this material, so if you need to take a break, no problem. Come back any time to get more. No. Each week’s module and assignment comes when it’s time, so you will not have upfront access to every week. This is to keep you focused – and not overwhelmed. Honestly, if you’re anything like me, you’d probably blow through the parts you *think* you’re already doing well with, which might be where your blocks come from. We’ll combat over-achievers and the overly-confident by restricting the amount of work you’re given. To see what you’ll be getting with each session, click here. CCC® is not about me dumping tons of information on you, wiping my hands, and saying, “See ya!” The material is intentionally structured so you get the best results. I release new material every week for 12 weeks. Five or so hours per week. The more time you put in, the faster you’ll see results. Five hours is my recommendation. But because CCC® comes with a lifetime access, you can go faster or slower if you want. Yes, you’ll discover exactly what your clients want to learn, how to package services that solve their problems, and what to put on your website to make sales. We even have an entire copywriting course inside. You don’t want to miss any of the sections of this course, but – if you think you do – it’s probably not right for you. This is a go-big-or-go-home, ride-or-die, all-or-nothing offering designed to cover your business from head-to-toe. A full-body makeover. So ask yourself, will anyone notice your polished heels when your collar is still wrinkled? Nothing can be sloppy or overlooked. This is a system, not a series of unconnected tactics. We can’t say for sure. We usually run this once a year. READY TO GET CLARITY, CLIENTS & CASH®? Non–Disparagement: In the event of a dispute between us, you agree to not engage in any conduct or communications, public or private, designed to disparage the Program, the Coach, Rebecca T. Dickson Inc., or any of the Program participants. Where required by law or arbitration, you are not prohibited from sharing your thoughts and opinions as a part of the legal process.